IMHO predication is not worth the trouble. 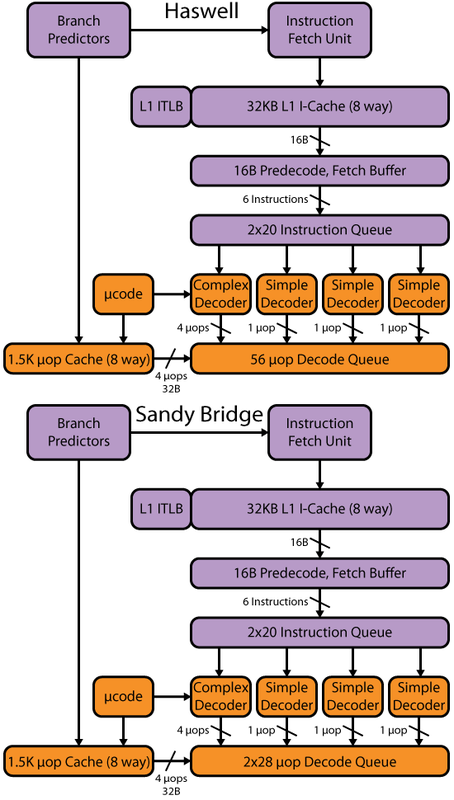 With advanced micro architectures, you'd better implement a good branch predictor rather than spending time implementing predication (which cost can be high). none (none.delete@this.none.com) on August 14, 2012 4:44 am wrote: > Richard Cownie (tich.delete@this.pobox.com) on August 14, 2012 3:57 am wrote: > > anon (anon.delete@this.anon.com) on August 14, 2012 2:37 am wrote: > > > David > > Kanter (dkanter.delete@this.realworldtech.com) on August 14, 2012 12:04 am > > > > > wrote: > > > > The new ARMv8 architecture is classically British; a clean and > > > > > elegant 64-bit > > > > I makes me a little sad - the delightful quirks of the > > original ARM are going > > (predication, LDM/STM, a free shift on every ALU op, FIQ > > registers) - in favor of > > a more generic vanilla RISC. But I look forward to > > seeing how fast they can make > > it go. > > Some data processing instructions still have the shift capability: add/sub, logical. > You should take a look at the binutils patch that was posted a few days ago :-) > > IMHO predication is not worth the trouble. With advanced micro architectures, you'd better implement > a good branch predictor rather than spending time implementing predication (which cost can be high).